The Wallet Utility Tool™: 12 utility and convenience tools packed into 1 millimeter of stainless steel. It's the perfect gift! Finally! 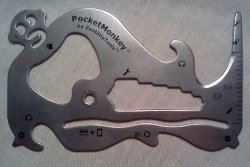 A pocket tool that is actually convenient. And it is even TSA-compliant. Text is laser engraved - easy to read and won't wear off!